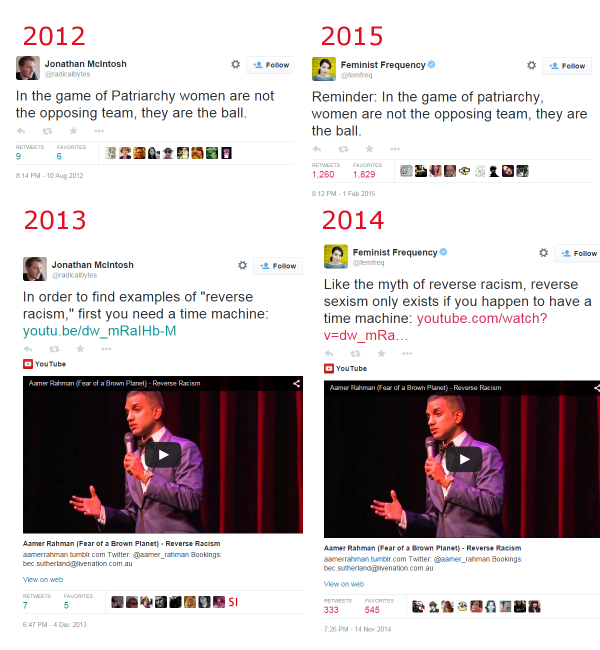 Feminist Frequency or Straight White Male Tweets: Re-branded. I came across this image today while perusing Twitter and this is something that goes back to one of my earlier posts. But, this is an even more flagrant example of Jonathan McIntosh using the apparent twitter page of Anita Sarkeesian to push his own ideology. Now, I understand that people can share an ideology. But, these are almost verbatim. Not only are these tweets identical but the first example is even used in the very first tropes vs women in video games video. But, in this instance Anita is being extremely disingenuous by saying "I’ve heard it said that 'In the game of patriarchy women are not the opposing team, they are the ball. '.” Well, where exactly have you heard it said? The only instance I can find is a quote from a man around August of 2012. Furthermore, when searching for this quote it's actively being accredited to Sarkeesian and not McIntosh. Now, for any normal man that would be truly painful to see your work accredited to someone else like that. It would take some kind of ideologically driven supercuck to let that slide. Because, in my honest opinion, I like getting the credit for the things that I do. And, you would think people of like mind that follow both McIntosh and the Feminist Frequency twitter accounts would be chomping at the bit to parrot his opinion as well as hers. Unfortunately it's hard to get an accurate read of how many followers the two accounts have in common. Some instances say it's not that many and others say that it's plenty so it's hard to say if McIntosh's ideas are simply ignored by those people because he's a straight white man but it certainly seems that his statements carry a lot more weight when there's a woman's face beside them. In my opinion the single greatest thing that can come from comparing these two sets of identical tweets is entirely in the retweets and favourites. I am well aware that the Feminist Frequency account has a lot more followers than McIntosh's, but, the same tweet has 140 times the retweets and 304 times the favourites when posted next to a woman's face. This alone is proof enough for me that male privilege in online spaces is a myth. Another thing to note is the threats directed to the Feminist Frequency Twitter account, threats that were recently chronicled in a post on the Feminist Frequency Tumblr page. Obviously threats like some of the ones seen in that post are deplorable. (Although, in the grand scheme of things not as great a number as first thought.) 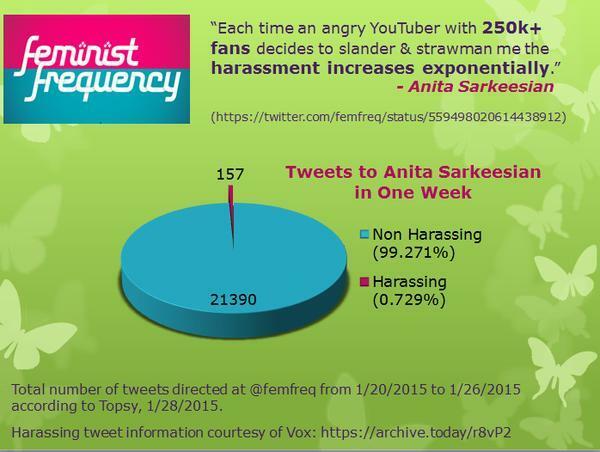 But, I can't help but feel that they're avoidable, after all, Feminist Frequency is a non-profit charity, not a person. It's very unusual for a charity or any business to run their business Twitter account with a picture of the CEO or owner. While there is no claim that all of the tweets on the page are written by Anita herself it would be safe to say that most people assume that it's her account due to the picture provided. In my opinion, changing it to a logo would not only be more honest, but, it could also cause the threats to dissipate.